Standard Awarichess is an extraordinary game of strategy which takes place for two players (or possibly for three or four players : see the end of the section "Miscellaneous") and which finds a part of its inspiration in two fantastic games of strategy : the game of Awélé and the game of Chess. We do not present any more the game of Chess, the king of the games. Of distant Indian origin, it is played in the western world since the Middle Ages already. Awélé is a combinatorial abstract game from African origin, considered as the African game of Chess. It is the most wide-spread of the mancala family, African games of type "count and capture" in which we distribute pebbles, seeds or shells in holes, sometimes dug on the floor. Awélé is the most common name of this game in the french language and the most used in Africa. In English, it is mostly called Awari. The original French name of "Awarichess" is "Awechec". "Awe" comes from "Awélé" and "chec" comes from "Echecs" who means "Chess" in French. Awarichess is a meta game. Indeed, the rules of the game of Chess are modified according to the progress of the game of Awari. We can say that there are so many rules of the game of Chess which there is of games of Awari. For those who do not know the rules of the game of Awari, refer to the appendix: " rules of the game of Awari ". The game of Chess contains quite a lot of rules. On internet, for example, there are very clear descriptions of this game (on Wikipedia in particular). Except if expressly said, the rules of these two games apply during a game of Awarichess. This game of Awarichess is a game " in complete information ", that is that it leaves no place at random. Welcome in this incredible game to the confluences of the West and Africa as the white and black squares of the chessboard. 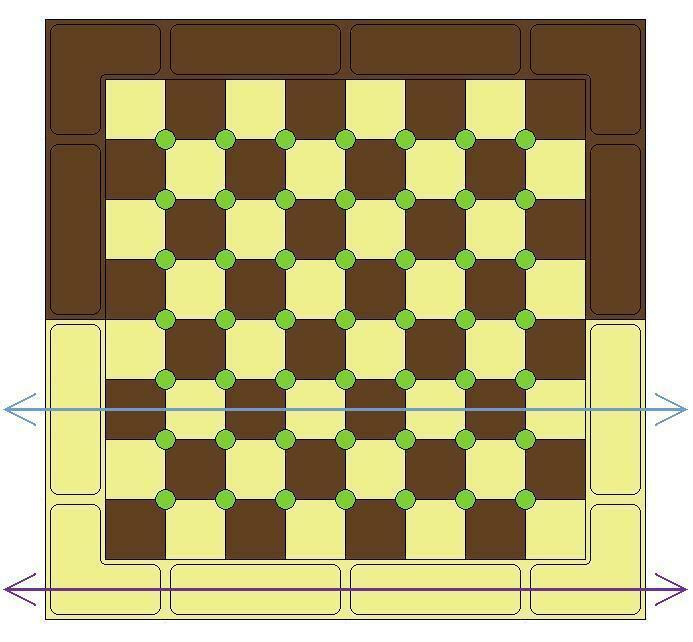 - An Awarichessboard including a chessboard of 64 squares (8 times 8) clear and dark, 49 green circles (7 times 7) on the border of squares and 12 holes surrounding the chessboard. - 50 green balls called seeds. 48 seeds only are necessary. Others are planned in case of loss. - 50 cones of clear color and 50 cones of dark color. 48 cones of every color are necessary in most. Others are planned in case of loss. 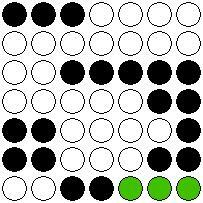 - 16 pieces of clear color and 16 pieces of color dark as in Chess. If we do not possess a game of Awarichess, we can play this game with a game of Chess and a game of Awari. View from the the top of the awarichessboard with the chessboard, the green circles between the squares and the holes for Awari outside. Section view of the awarichessboard with the Chess pieces, the green seeds and the clear and dark cones. As in Chess, the objective of the game is to checkmate the opponent. We agree for whom will have the whites or we decide it by the use of random. We begin playing Awari. The one who begins at Awari is the one who has the whites at Chess. It is thus always the "South" camp in Awari (see the rules of Awari). On the beginning, the position is the one of the beginning position at Chess and at Awari. 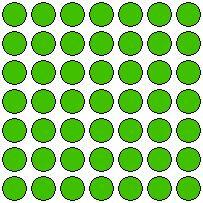 The green circles between the squares are idle at the moment. You can play with handicap in case a player is much stronger as the other one. Refer to the paragraph on the handicaps if you want to play so. Arrived towards the end of the game of Awari, the possible remaining seeds which would be to share according to the rules of Awari at the end, are simply removed from the game and are not thus converted in powers. As in Chess, the whites begin to play, then the blacks will play, then the whites, and so on. A special move exists besides the normal Chess moves : the "zero move". To play the "zero move" consists in lifting delicately his king a brief moment of the square where he is … to re-put down him in the same place. - He has neither the right to play a normal move of Chess nor the zero move. -> he is mate and lost the game of Awarichess. - He has no right to play a normal move of Chess but could play the zero move. - > He is stalemate and the game of Awarichess is a draw. - He has the right to play a normal move of Chess but not the zero move. - > He is in check but not checkmated. He chooses the way of adorning the capture of his king. a) If the power is white and if the whites have the move, the whites decide if they are going to play the zero move or a normal Chess move. If they decide to play a normal chess move, they choose this move and play it. b) If the power is black and if the blacks have the move, the blacks decide if they are going to play the zero move or a normal Chess move. If they decide to play a normal chess move, they choose this move and play it. c) If the power is white and if the blacks have the move, the whites decide if the blacks are going to play the zero move or a normal Chess move. According to this choice, the blacks will pass its turn or will choose their move among the possible normal chess moves and play it. d) If the power is black and if the whites have the move, the blacks decide if the whites are going to play the zero move or a normal Chess move. 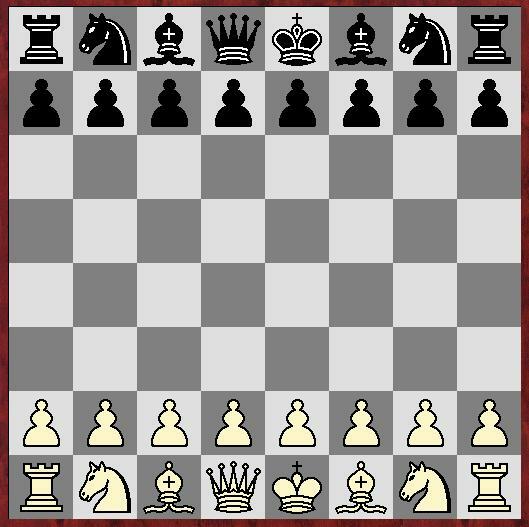 According to this choice, the whites will pass its turn or will choose their move among the possible normal chess moves and play it. When all the powers are consumed and if the game of Chess is not ended, we begin again a new game of Awari and the whites who are always the South in Awari begin. To note that it is not an advantage to begin in Awari. So the whites who begin in Chess are not favored. We so play possibly several games of Awari in alternation with sequences of Chess moves until the end of the Awarichess game. On the other hand, the rule of threefold repetition of a position does not exist in Awarichess because the situations never repeat because the powers in play are never the same. Please note : If you have not the equipment of Awarichess, you can feign the powers with some paper and a pen. The strongest player and which thus bears the handicap obtains only two powers for three collected seeds. For example if this player collects 5 seeds, he obtains only 2 powers to be placed on the green circles for 3 gained seeds. On the other hand, he keeps the 2 remaining seeds which can be used when he will have collected the other seeds. At the end of a game of Awari, the possible remaining seeds are simply abandoned. This system of handicap is specially convenient for a player who obtains usually approximately 3/5 of the seeds. According to the same principles, the strongest player obtains only a power for 2 collected seeds. This system of handicap is specially convenient for a player who obtains usually approximately 2/3 of the seeds. In case of very strong disparities of strengths we can even envisage the handicap 3/1 according to the same principle. The whites win 3 seeds. The blacks win 2 seeds. The whites win 2 seeds. The whites win 5 seeds. The game of Awari continues till the end and the list of the powers is constituted. White has to play and the first power is white : white decides to play and plays e4. Then, black has to move and the next power is white : white decides that black must play the zero move (pass his turn). Black lift his king of his square … to rest him in the same place. Then, white has to move and the next power is white : white décides to play and plays Bc4. Then, black has to move and the next power is black : black décides to play and plays Nc6. Then, white has to move and the next power is black : black decides that white plays the zero move. Then, black has to move and the next power is white : white decides that black plays the zero move. Then, white has to move and the next power is white : white plays Nf3. Then, white has to move and the next power is white : white plays Ng5. Then, black has to move and the next power is black : black plays Nh6. Then, white has to move and the next power is white : white plays Qh5. Then, white has to move and the next power is white : white plays Bxf7+. Then, black has to move and there is no question of power because he must play in any case as he is checked : black plays Nxf7 as it is the only legal move here. Then, white has to move and the next power is white : white plays Qxf7# (checkmate) and wins this game of Awarichess. Often games of Awarichess are much longer and require several games of Awari. They give rise to impressive sequences of moves and which owe nothing at random ! 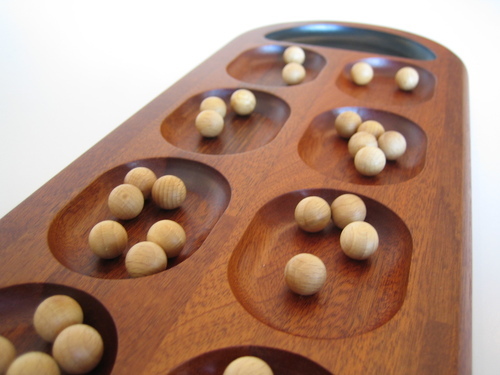 Le game requires an Awari board called "mancala" who has two straight rows of six pits, called "houses" and 48 seeds common to both player. The game begins with four seeds in each of the twelve houses. Each player controls the six houses on their side of the board. The player who begins is called "South" and his opponent "North". Players take turns moving the seeds. On a turn, a player chooses one of the six houses under his control. The player removes all seeds from that house, and distributes them, dropping one in each house counter-clockwise from this house, in a process called sowing. Seeds are not distributed into the house drawn from. That is, the starting house is left empty; if it contained 12 or more seeds, it is skipped, and the twelfth seed is placed in the next house. After a turn, if the last seed was placed into an opponent's house that brought its total to exactly two or three, all the seeds in that house are captured. If the previous-to-last seed also brought an opponent's house to two or three, these are captured as well, and so on. However, if the only move is a move that would capture all an opponent's seeds, the move is exceptionnaly allowed but the capture is forfeited, and the seeds are instead left on the board, since this would prevent the opponent from continuing the game. A move of the South camp is represented by one of the capitals A,B,C,D,E,F following the houses chosen by South to take its seeds for the sowing. The house most to the left of South is A and the house most to his right is F.
Also a move of the North camp is represented by one of the small letters a,b,c,d,e,f following the houses chosen by North to take its seeds for the sowing. The house most to the left of North is a and the house most to his right is f.
Furthermore, if South, for example, wins 3 seeds at the E move, we note his move by E(3).